A reproduction from a large family group picture taken in Italy in 1910. Members of the Wyeth Laboratory committee, who were arranging a party for employees’ children, given December 15, in the Rowland School, select a tree for the occasion from Hyacinth D’Ignazio on the “Fronefield Building Corner.” From left to right, with Hyacinth and Hyacinth Jr., are Howard Gear, Peggy McGee, Virginia Rutledge and Charlene Hennessey. With Christmas now so close at hand, the excitement of Wayne shopping days, followed by shopping evenings under multi-colored street lights, is now approaching its end for 1956. From year to year, much of the local holiday setting changes, if only in small ways. 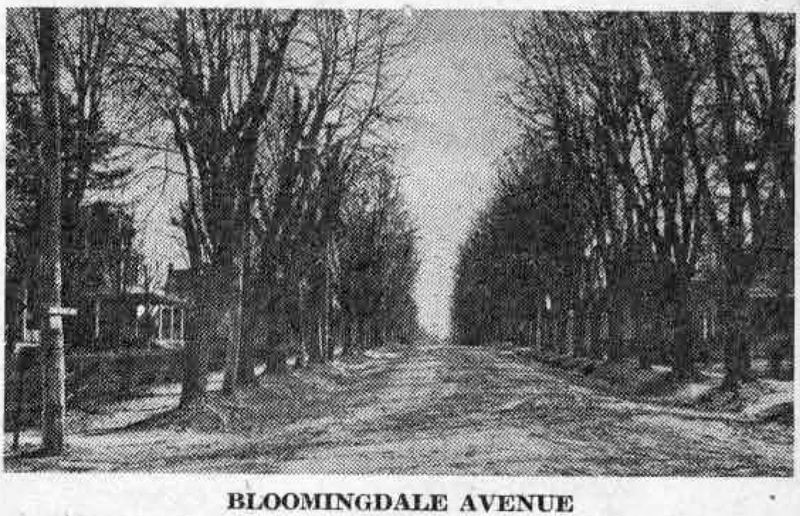 But, since December, 1906, just 50 years ago this month, the same Christmas tree merchant has sold trees, wreaths and other festive trimmings on the southeast corner of Lancaster and South Wayne avenues. 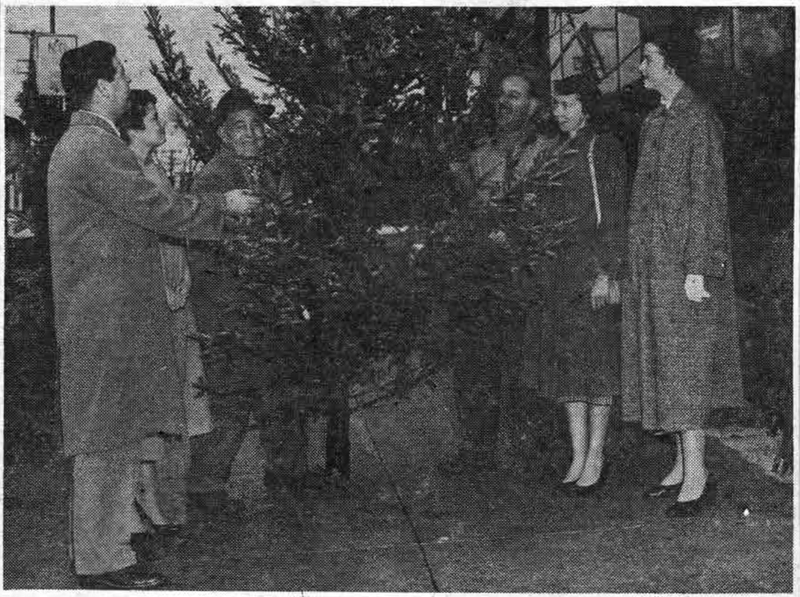 In December, 1906, Hyacinth D’Ignazio, now 74 years old, sold the first Christmas trees ever to be bought on the streets of Wayne, in partnership with his brother, the late John D’Ignazio. To the old timers among us, that corner site, now occupied by the Sun Ray Drug store, is still known as the “Fronefield Corner,” for in 1893 the late Joseph M. Fronefield, Sr., bought what was then the west hall of the present Lienhardt Bakery building. His drug store was moved here from the old Lyceum building across the street, and in 1926 he erected the present brick structure known as the Fronefield Building, with its various shops and offices. Before John D’Ignazio, assisted by his brother Hyacinth, set up his outdoor stands for the sale of Christmas trees and greens, they were sold in Wayne only at the Etchingham and the Adelberger nurseries. The former was located on North Aberdeen avenue and the latter on the same site it still occupies on Conestoga road. 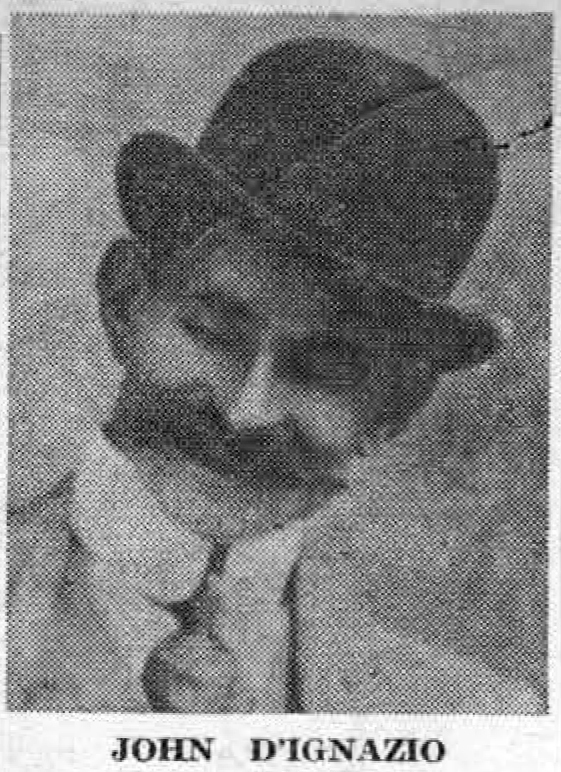 John D’Ignazio’s first job after coming to America In 1900 was with Adelberger’s. Later he went into business for himself on Highland avenue, as a landscape artist and florist. In 1910 he returned to Italy for a visit, taking with him his entire family. While there he contracted pneumonia and died, leaving his wife, Julia, to bring the children back to America alone. Besides Alnardo D’Ignazio, who operates the Wayne Diner, surviving children are Mrs. Edith DiBonaventura and Mrs. Louis Phillip, both of Wayne; Mrs. Carl Milan, Sarasota, Fla., and Mrs. Rudy Gambacorta, Riverside, N.J. The practice of making their own wreaths and other decorations is still carried on by his brother, Hyacinth. The latter’s kitchen, in his home on West Wayne avenue, presented a cheery scene as the writer visited there one evening recently. Busily at work with Hyacinth was his daughter, Splendora, while two grandchildren, Bill and Mary Jane Hansell, added their youthful bit. Later, Hyacinth, Jr., joined the family group. This work goes on for some weeks before the stand on the corner is opened in early December. As a young man, Hyacinth learned his art in Italy, where his whole family was skilled in this work. Each Christmas season he tries to originate something new in the way of sprays or of table baskets, using wild grape vine and wire as frames. The laurel which be ties in “never comes out,” Hyacinth says, adding that this is a method which he has originated. He sell 1,000 or more of these wreaths each Christmas season – many decorated with holly and cones, others are made from hemlock and pine. His laurel comes from his own 114 acres in New Jersey. At the time of the visit, Hyacinth’s daughter was busily at work making long strands of greens into door trimmings, using spruce, yew, Douglas fir, pine branches and cones. Wayne Post Cards: Saturday Club, South Wayne Ave., St. Luke’s School, Bloomingdale Ave. 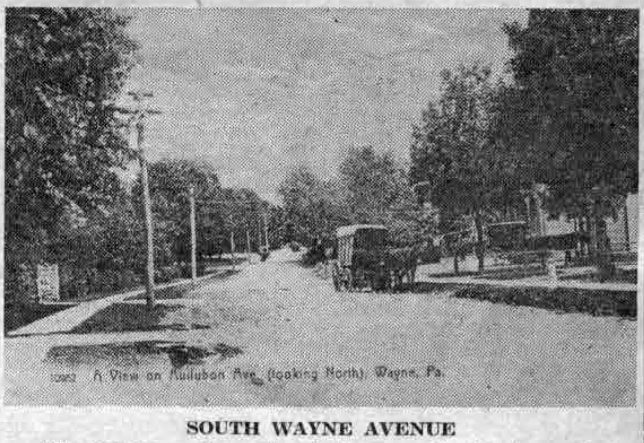 The group of postcard pictures of Wayne of an earlier day which have recently been presented to the writer by Harry M. Buten, of Merion, contain several of various buildings or streets about which this columnist has written during the past few years. In some instances the articles have been without illustration, since none were available at the time. Today’s column shows four of Mr. Buten’s postcards of Wayne in the 1880’s and early 1890’s. 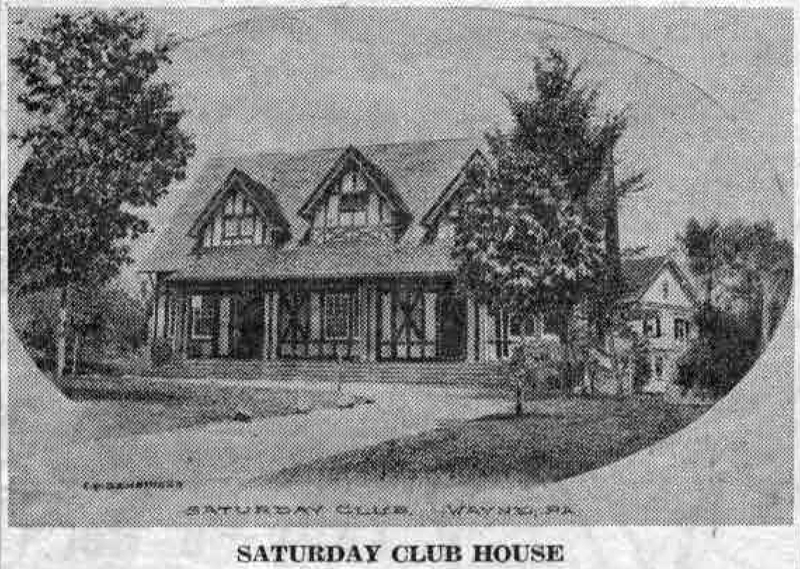 Although other pictures of the Saturday Club House have been shown in this column, this is undoubtedly one of the quaintest. In October, 1898, the Board of the club authorized the building of the club house, at a total cost for both lot and building of $5,145. It is the oldest woman’s club house in Delaware county, and one of the oldest in the state. The caption on the postcard picture reads, ”A view on Audubon avenue looking north.” It shows what is now called South Wayne avenue, looking north towards Lancaster pike from the Dr. Robert P. Elmer home, in the 1890’s. 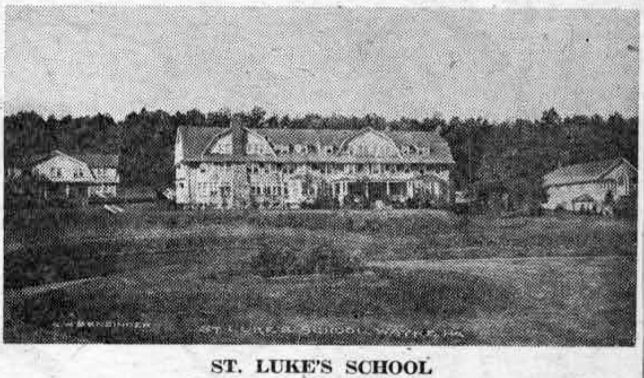 This well-known school for boys was located at the northeast corner of Eagle and Radnor roads. Later the main building, along with several other small ones, was purchased by St. Davids Golf Club. Since September, 1928, it has been incorporated into the Valley Forge Military Academy. This is a view of the block extending south from Lancaster avenue to West Wayne avenue, as it looked when its large and pretentious houses were completed in the late 1800’s. This might be called Wayne’s first building operation, and was conceived by George W. Childs and Anthony J. Drexel, prominent business men of Philadelphia.